Dep from Gorakhpur Overnight at the hotel in Kathmandu. 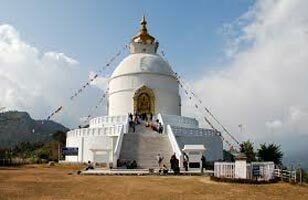 Full day sightseeing tour of Kathmandu including the ancient Palace of the Kings, the hilltop Stupa of Swayambhunath, Pashupatinath Temple. Pashupatinath Temple dedicated to the lord Shiva, is one of the holiest shrines of the Hindus. It also draws a large number of visitors from India. India has the largest population of the Hindus in the world. Besides India, a travel to the Himalayan kingdom is a must for the Hindus to cover the pilgrimage tours. Evening free to shop around. Overnight at the hotel in Kathmandu. Morning travel to Bhaktapur, part of the Malla regime known as Bhadgaon famous for its preservation of traditions & culture. It is also one of the UNESCO heritage site. After the sightseeing travel to Nagarkot, situated at an altitude of 2175 m above the sea level. It offers grandstand panorama of Dhaulagiri in the west, Kanchenjuga in the east. You can see more than five of the word's tallest mountains like Lhotse (8516 m), Cho Oyu (8201 m), Makalu (8463 m) and Manaslu (8163 m) and many other lesser summits including the highest peak Mt. Everest (8848 m). The magnificent view of the snow peaks especially during sunset & sunrise fills one with awe. View the gorgeous sunset from here. Overnight in Nagarkot. Wake up early to watch the gorgeous peaks during sunrise. After the marvelous view proceed towards Pokhara, a charming city. Enjoy the colorful town of Pokhara. Overnight in Pokhara. 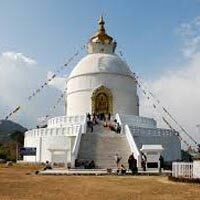 Morning sightseeing tour includes Pokhara valley, Davis Fall, Mahendra Cave, the famous Seti George and some beautiful temples like Bindhabasini Temple, Pokhara Museum. Explore the enchanting town in the evening. Overnight in Pokhara. Morning drive to Kathmandu. Check in at the hotel. Time for shopping for last minute souvenirs. Overnight in Kathmandu. Departure After checking in out of the hotel transfer to the airport to catch flight for your ongoing destination.